The stainless steel liquid tank trailer is an improvement over traditional liquid tanker trailers as the stainless steel construction is 4 to 6 tons lighter. The tank is overall lighter, can carry heavy loads, and provides energy savings out on the road. The tanker is designed for the transport of oil, crude oil, gasoline, diesel, liquid acids, asphalt, and other liquid products. 5. Steel crown to whole length of tank. 10. When the trailer is in high temperature environments, the pressure within will be automatically regulated in order to prevent the pressure from building to the point of explosion. When the working pressure inside the tank exceeds the external pressure of 21-32KPA, the emergency exhaust device will activate with a maximum displacement of 7000 cubic meters per hour. This will effectively prevent the danger of an explosion. Sanxing has been manufacturing heavy duty vehicles and special vehicles since 1994. 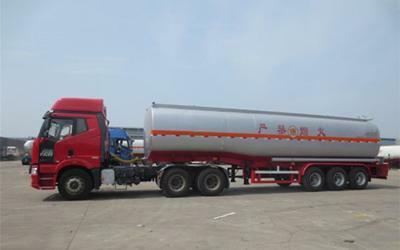 Besides the stainless steel liquid tank trailer, we offer a wide range of aluminum alloy fuel tank trailer, diesel fuel tank trailer, flatbed trailer, cargo semi-trailer and so on. From the raw material selection to manufacturing process, we have rich experience and offer high quality stainless steel tank semi-trailers and other special transport vehicles with custom solutions.